Tokyo, Japan, December 21, 2012 – NSK Ltd. (NSK; Headquarters: Tokyo, Japan; President and CEO: Norio Otsuka) today announced that it has added the new Megatorque Motor™ PX Series with high?acceleration to its line of Megatorque Motor™ products that are widely used manufacturing industry. This product dramatically reduces the positioning time when transferring light items such as electronic components, contributing to improved throughput and reliability for inspection equipment for products such as LEDs and automotive ICs. NSK will start providing samples of the product from July 2012, with full sales starting in October 2012. NSK is targeting 1,500 million yen in sales of this product in 2015. NSK exhibits this product at the TECHNO-FRONTIER 2012 21st Motion Engineering Exhibition at Tokyo Big Sight (Koto-ku, Tokyo) from July 11 (Wed) to 13 (Fri) 2012. Driven by the increased demand for smartphones and liquid crystal TVs, in East Asia countries including China, Taiwan, Korea are rapidly increasing production of electronic components such as LEDs. Furthermore, the global demand for LED lighting will continue to grow due to the need of energy conservation. On the other hand, in Japan, Europe and America, there is also a growing demand for automotive ICs for hybrid and electric cars, and for electronic control devices for applications such as electronic stability control. Recently these sectors have been seeking improved productivity by increasing the speed of production processes and ensuring higher quality. On the other hand, in order to achieve even greater reliability, 100% inspection of ICs is becoming the standard, so users are seeking more improvements in test equipment. To meet these needs for advanced technology, NSK is offering the new Megatorque Motor™ PX Series with high acceleration. The double acceleration and deceleration are achieved by reducing the moment of inertia* of moving element (rotor) of the motor significantly, and designing the winding to produce high output, compared to earlier models. * Moment of inertia: A value indicating the amount of inertia of a rotating object, calculated by finding the product of the square of the mass of the object and the distance from its rotating shaft. The unit is in kg·? 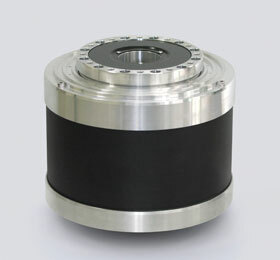 The enhanced rigidness of the motor structure suppresses vibration of the rotary table, enabling better accuracy. The structure is designed to prevent the heat generated by the motor to reach the rotary table, which would affect accuracy. While the outer diameter size remains the same as earlier products at ?160 mm, the hollow diameter is ?35 mm to allow room for suction nozzle tubing and signal wiring. In addition, the outer circumference of the motor has no projecting parts so that the system can easily be arranged without hesitation. NSK as a pioneer of direct drive motors started mass production Megatorque Motor™ products in 1985, and NSK’s technical innovation has kept pace with advances in semiconductor and liquid crystal manufacturing equipment in Europe, America and Japan. In recent years, China, Taiwan, and Korea have become major producers of electronic devices such as LEDs, and these countries are a significant market for Megatorque Motor™. East Asia is becoming a major electronic device manufacturing cluster, and NSK has strengthened its marketing activities in the region and reflected feedback from its customers in product planning. NSK will continue to respond to the needs of increasingly sophisticated worldwide markets, expanding sales of its Megatorque Motor™ worldwide.